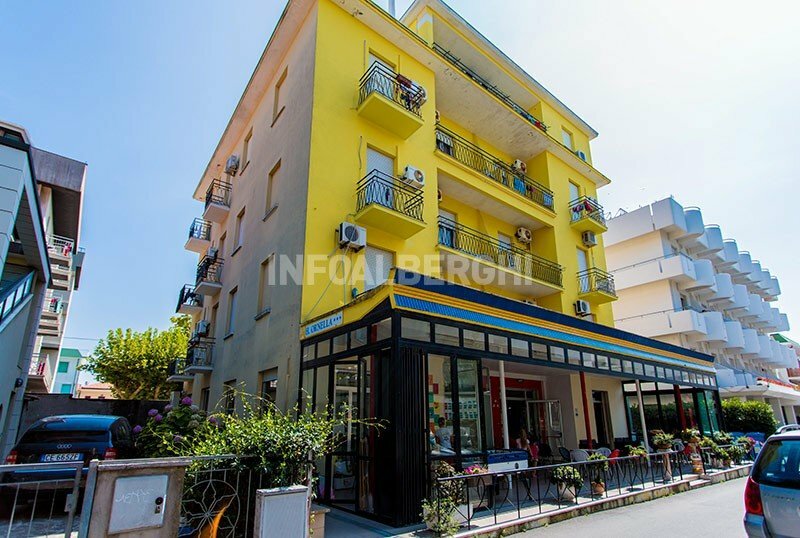 Hotel Ornella , 3 stars located in Igea Marina, offers guests free air-conditioned rooms and parking within walking distance from the property. Admitted pets of all sizes. The hotel is in Igea Marina, a two minute walk from the beach and a fifteen minute walk from the Parco del Gelso. Balcony, sea view, air conditioning, WI-FI, safe, telephone, satellite TV and digital terrestrial, minibar, private bathroom with shower curtain and hairdryer, courtesy set. FAMILIES : available rooms for families or connecting rooms. PARKING: uncovered and covered parking for free for all clients, 500 meters from the hotel. AIR CONDITIONING : present throughout the structure. CONVENTIONS : beach, amusement parks, swimming pool, law enforcement. Possibility of organizing excursions (for a fee). PETS : allowed of all sizes. BREAKFAST : international, with homemade desserts, brioche, cereals, yogurt, fruit juices. LUNCH AND DINNER : national and typical local cuisine with a choice between two meat and fish menus followed by a buffet of side dishes and vegetables. Water, wine and soft drinks at meals in every accommodation package. VARIATIONS : vegetarian dishes available. In hotel : strollers, playground for children on the open-air porch, mini club and entertainment, indoor playground area, baby sitter and pediatrician (fee), minibar in common area. In the room : cot, bottle warmer. At meals : seats at the table, baby food, early entry to the restaurant, afternoon snack. Hotel Ornella has an agreement with Bagno 65, a bathing establishment equipped with facilities for adults and children. Prices are per day per person for min 3 days. For Special Weeks the price is per person per 7-night stay. During promotions: FREE children up to 14 years. Free if in room with 2 adults and during promotions are always free! In room with 2 adults and during promotions are always free! If you book your holidays well in advance you will get big discounts on the final price! Ask for an estimate without obligation! Prices (min 2 nights) with drinks included. Example: Family package 2 + 2 children with arrival 20 April for dinner and departure on Monday 22 April after lunch. - Full board with drinks included at 125.00 / person. Children free. - 4 nights in Full Board drinks included the double € 320.00 total !! Do you have other needs? Ask us for a free quote! 3 days all-inclusive starting from € 120 per person! Drinks with meals included !!! 2 days ask for a quote! On holiday alone with your child? Happy Children ... Here is our proposal! Wonderful idea for a holiday with your child, not to lose even a moment of his smiles by the sea! Child-friendly services with removable bed rails, bath tubs, high chairs in the dining room. Flexible meals. Dedicated to children!